Clearing the cache in Firefox isn't something you have to do every day, but it is sometimes helpful in order to solve or help prevent certain problems. The Firefox cache contains locally saved copies of recent web pages you've visited. This is done so that the next time you visit the page, Firefox can load it from your saved copy, which will be much faster than loading it all over again from the internet. On the other hand, if the cache doesn't update when Firefox sees a change on the website or the cached files that do load are corrupted, it can cause web pages to look and act strangely. Follow the simple steps below to clear the cache from your Firefox browser, valid back through Firefox 39. It's an easy process that takes less than a minute to complete. Clearing the cache in Firefox is completely safe and should not remove any important data from your computer. To clear the Firefox cache on your phone or tablet, check out the next section. Click the Menu button (aka the "hamburger button" from the top right of the program - the one with three horizontal lines) and then choose Options. With the Options window now open, click the Privacy & Security or Privacy tab on the left. In the History area, click the Clear History... button. If you don't see that link, change the Firefox will: option to Remember history. You can change it back to your custom setting when you're done. Doing this will remove all the cached files, but you can pick a different time range if you'd like. See Tip 5 below for more information. Don't see anything to check? Click the arrow next to Details. When the Clear All History window disappears, all of the files saved (cached) from your internet browsing activities in Firefox will have been removed. Clearing the cache in the Firefox mobile app is very similar to when using the desktop version. Just open the Settings menu within the Firefox app to find an option called Clear Private Data. 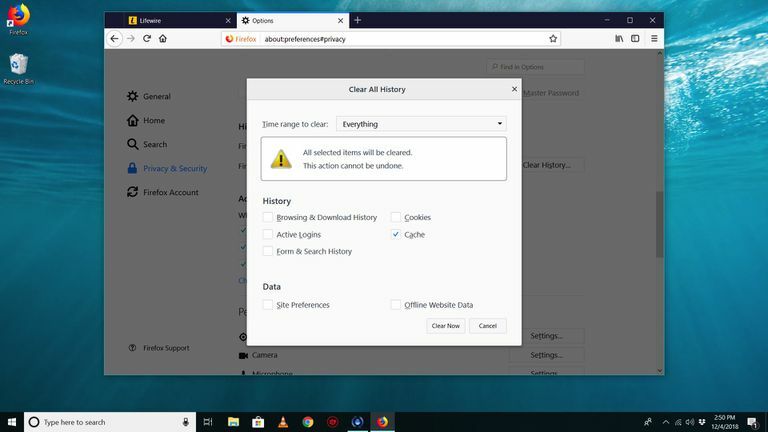 Once there, you can choose what type of data to erase (like the cache, history, offline website data, or cookies), much like in the desktop version. Tap the hamburger menu in the lower right-hand corner. It looks like a stack of horizontal lines. Tap Settings in the slide-up menu. Swipe up to the Privacy section, then tap Data Management. Toggle ON or OFF the type of data you'd like to clear. Then tap the red text that says Clear Private Data. Confirm with the OK button in the next dialog. Using the Ctrl+Shift+Delete combination on your keyboard will immediately put you at Step 5 above. If you'd rather not delete all the cache stored by Firefox, you can instead pick a different time range at Step 5. You can pick Last Hour, Last Two Hours, Last Four Hours, or Today. In each instance, Firefox will only clear the cache if the data was created within that time frame. Malware can sometimes make it difficult to remove the cache in Firefox. You might find that even after you've instructed Firefox to delete the cached files, they still remain. Try scanning your computer for malicious files and then starting over from Step 1. You can view cache information in Firefox by entering "about:cache" in the navigation bar. If you hold down the Shift key while refreshing a page in Firefox (and most other web browsers), you can request the most current live page and bypass the cached version. This can be accomplished without clearing out the cache like described above.